So, uhm, for your comfort I opened this thread, instead of spamming it there. Feel free here to chatter about your characters, asking questions about the RP, and to ask about permissions about characters and more. Join my RPG- The Noble Bird Quest! The Noble Bird Quest Chatter and Character Thread! About 150 years ago, with the help of the – then living – avatar, chief Kosun united two tribes. The Kaji’s and the Shi’s, thus becoming the founder of the Kaji Shi clan. Chief Kosun then built a large, magnificent, walled city for the newly found tribe. This first city of the archipelago was later named ’Kosun.’ Named after its founder. After a long, peaceful and prosperous lifetime, his son, Kahei (pronounced: Ka’hei) took upon himself the mantle of leadership, vowing to change the world as they knew it. It took the new chief ten years to fulfill that vow. Ten long years had the chief trained and prepared his warrior army for an upcoming war. Too long were they forced to share their island with so many of those puny tribes. To share their island, their space and most of all: their resources. 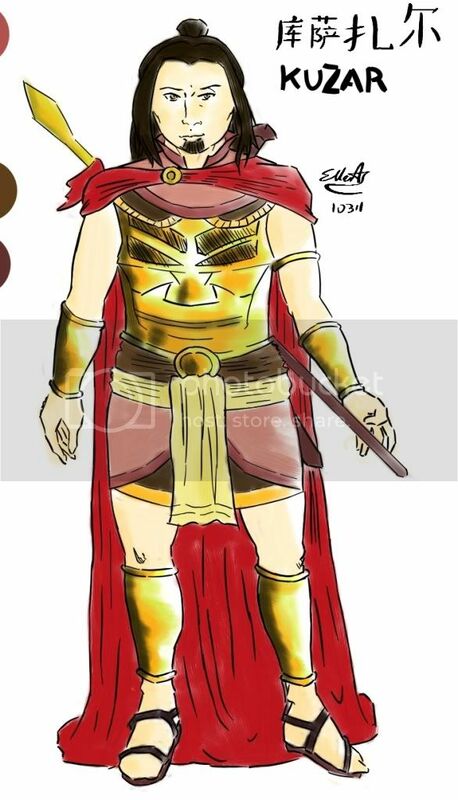 Even though Kahei’s court was shining with gold and diamonds, and even though the armor of his officers were often golden plated, it was still not enough. Yes, Kosun, his city was considered a metropolis and well protected from the other tribes. None of them would even think of attacking his tribe… for now. For now they wouldn’t dare to attack him. But what if they would unite? Just like his own father had done to their tribe. In that case, they could form a real treat to him. Kahei didn’t want to take this risk and to let all of the good land and resources fall in the hands of those unworthy barbarians. There was only one option left. And so it was that Chief Kahei’s conquest began when Kuzar was eight years old. Many tribes fell. One after the other were wiped out, scattered or pledged allegiance to the Kaji shi tribe. The tribal leaders that pledged allegiance were appointed warlords and received their own lands where they could maintain jurisdiction in name of the Kaji shi tribe. Every month they were obligated to pay their taxes in resources, crops and cattle, and sometimes… in people. Kosun was no more the only walled city on the Kaji shi’s island. Today there were many more. All fiercely loyal to Kahei’s tribe. For Chief Kahei would only appoint people from his own capital to lead those other walled cities. After a conquest of 16 years, the Kaji shi control most of largest island of the Fire Nation archipelago. Having forced the surviving tribes of their territory to accept them as their overlords. However, the conquest is not complete yet. There is a last part that is still to be conquered. But rest assured that the Kaji shi will not stop until their goal is fulfilled. - Image II – Kuzar in normal armor, in which he walks around mostly. - Kuzar in ceremonial armor. Personality: Intelligent, clever and bright. Proud. Very proud. As a born leader he might sometimes also be very stubborn and not always appreciate whatever a ’commoner’ has to say. Trained for war, conquest and tribal politics, it isn’t always easy to gain Kuzar’s trust. But aside all this, he does love to have fun. The only thing is that he has hardly ever time for it. 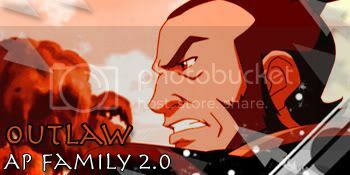 He was born to chief Ka’hei of the Kaji Shi clan, on that what we known as the Fire Nation archipelago. Kuzar is the oldest child to his parents, with two brothers (Kaja – aged 22, Bulan – aged 15) and one sister (Ta-min, aged 20) below him. At least, those are the legitimate children of his father. The fact is that Kuzar has many more half-siblings of his father’s concubines. But those really didn’t count, after all: they were just slaves. Admittedly they were slaves with a higher status. They were allowed to supervise other slaves and to serve the chieftain’s family and if they did really well, they were allowed to defend their tribe’s honor as officers on the battlefield. But by the end of the day… they were still slaves and nothing more. Slaves. Children of his father’s slaves: the concubines. Women that were either captured during his tribe’s endless conquest of the island, or women that were offered as bribes, rewards or as deals for peace treaties. For Kuzar's tribe was not a normal tribe. It might have started as a normal tribe, but Kuzar’s grandfather was sure to have changed everything. As said before, the Kaji Shi is the dominating tribe of their island. Having subjugated most of the Fire Nation tribes to their rule. Kuzar, being the oldest son of the chief is therefore also the heir of their tribe. A privilege and burden that never went unnoticed in his life. Always being reminded about it by virtually everyone. From his father to his teachers, to his friends and even his siblings. Never was he allowed to just fool around or to play like normal children. There were always lessons to follow or classes to attend. For, “the future leader of the Kaji Shi, will have to know how to face his enemies in battle and how to control his tribe at the same time,” was something that his father always told him. Yes, this also meant that he had to be an excellent warrior. No, as the chief’s son, he had to be the very best. Being on warpath though, had always been a welcoming break of the heir’s studies. He loved to lead his people, his men, into battle and having enemy tribal chiefs bowing before him and kissing his feet and hand afterward… begging for their lives and pledging allegiance to his father. Kuzar always enjoyed these moments. Moments which added to his honor, prestige and pride. Not even to mention the victorious returns to Kosun with caravans laden with spoils of war, slaves, slaves and more slaves. Some to keep, some to sell and some to satisfy the spirit world. Back in his home city, Kuzar has many friends. Though one could always wonder whom of these people were actually real friends. Because, doesn’t everyone want to be close to the chief’s son, a mighty warrior himself? But even with these complications there are at least two real friends that Kuzar has. Shoji and Talak have been Kuzar’s best friends since they were little kids. Like real brothers to each other’ it was impossible to separate the trio. Impossible for humans, but oh-so-simple for their social duties to do so. Kuzar, as the heir, was often called away for his many lessons and had to join the tribe’s military leadership in the end. Today, Kuzar is a well known and important figure in his tribe. Having subjugated tens of tribes to his father’s rule and having brought wealth and honor to his tribe and family. In his daily life, when he is back at Kosun, chief Kahei never allows his son to just hang around. There was always something to do. 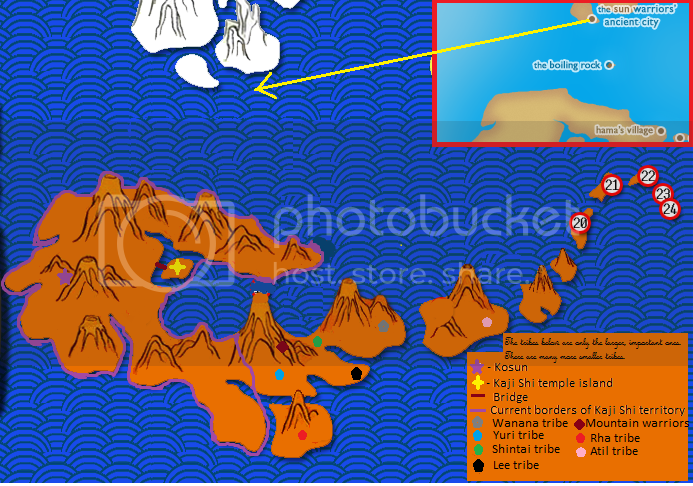 A war meeting, a pilgrimage to Temple Island (which always included sacrifices), diplomatic meetings, inspecting the borders, or performing tribe rituals. There was always something. Always those social duties.. those obligations to his tribe. But then again: they did deserve it, for they worshipped him, his father and his siblings as deities. Which they were of course. The spirits had put them in these earthly bodies to lead their people. Tools of Trade: Always carrying with him a dagger, ’sword-like’ sword and a spear [Clicky II]. Even though he is considered to be one of best benders of his tribe, he tries to use it only when necessary. Making his opponents often underestimate his bending skills. The Kaji Shi are allied to the ’mountain warriors’ and Atil tribes. The first live in the mountains of the not yet conquered territory. The latter live on a nearby island of the archipelago. The major enemy of the Kaji Shi is the Wanana tribe. Only recently’ Chief Wanana formed an alliance with the Yuri, Lee, Rha and Shintai tribes. All hostile towards the Kaji Shi. There are many, many more tribes in both Kaji Shi territory as in the not yet conquered parts as well as on the other islands. The ones mentioned on the map are just the major, important tribes. excellent- tell me when you wish to start the game, and if you have any questions before we start. Alright I finally got it all written up. Appearance: Green eyed and slightly taller than average Solus keeps his brown hair cut short. He wears the traditional clothing of his people comprised most notably by a grey robe like coat known as a deel, a pair of black trousers, thick boots, and a sash tied around his waist made from the pelt of a carcajou. Personality: Solus has a laid back and easy going, but rather snarky, demeanor. He does not believe in mincing words and will tell you exactly what he thinks about something or someone regardless of who it offends. Like the rest of his tribe Solus believes in merit over birth and while he may sell his skill set for coin he refuses to sell his respect. History: Solus had grown up the same way all children of The Buurenaar had. He had been raised by his father in the same way his father had raised him and his father had raised him; the same way Solus would one day raise his own son. Since the day he could walk he had been trained in both personal and group level combat. Since the day he could comprehend speech his was taught the art of war and the ways of his people. As is tradition when Solus came of age at sixteen he joined one of the mercenary companies of his tribe, however unlike most who only serve one three year tour before choosing a mate Solus had served three tours as a scout and still had no intention of starting a family. Now he readies himself to leave the mountains of his people once more; intent on seeing what the rest of the world has to offer before settling down. Tools of Trade: Being a scout Solus carries a composite bow with a belt quiver, the traditional Kukri knife, along with various other woodsmen tools such as flint and tender. Deep within the Earth continent there lays a particular string of mountains. The northern end of this range begins along the eastern coast at what is known as chameleon bay. The range moves down to the southern end of this continent and turns west toward the far coast. At the far western end there stand a group of mountains which tower far above all of their brethren in the range; they are known amongst the locals as the Redhorn Mountains. It is here, where furious thunder storms arrive frequently and with little warning, that a tribe of barbarians make their home. They call themselves the Buurenaar and are known amongst the locals for their banditry and mercenary activity. In the belief that knowledge of something gives you power over it I have written this scroll so that we might become more knowledgeable of a potential opponent. Before I delve into an in-depth analysis I shall deliver a general synopsis of what we know of The Buurenaar. What we know about the religion and spiritual practices of The Buurenaar is rather limited we do know that war and conflict feature prominently in it but the exact details remain a mystery; the most common hypothesis is that they worship a deity of war and death. They are also very territorial preventing caravans and lone travelers alike from wandering their mountains unless they pay an exorbitant toll and even then they do pay they are forced onto paths of The Buurenaars choosing. Their reputation as bandits and vagabonds is however slowly being eclipsed by their mercenary activity and of the quality of their skill in battle; which according to what reports we have of it is leagues ahead of their neighbors. However I should note that what information we have on their culture and their exploits comes either from second hand reports or from information gleamed from their mercenaries, information from the former is subject to inaccuracies and information from the latter may not be representative of the rest of their society. It is for this reason that I would also propose a study of The Bruurenaar that would provide this academy with more firsthand knowledge. I got permission from CZ to add this part. Name: Is known to all as Lilli. Tribe: Lilli is a member of the Nanmin, the refugees, those who have been driven from their home tribes for multiple reasons. They tend to travel, opting to live as roaming nomads with collapsible and portable housing. They hunt and gather their food, and their main priority is to keep those within the tribe safe. Personality: Lilli is stubborn, brash, and strong-willed. She will do anything to protect those who are close to her, and is very protective of her past. Her past constantly haunts her, and often drives her to some of her brash actions. She was raised to be the perfect wife and mother, and to allow the man of the house to protect the family. Because of this, she has been forced to learn to defend herself with small daggers she keeps on her person at all times. Combined with her firebending, Lilli is an opponent that no enemy of hers wants to meet in battle. History: When nineteen years old, Lilli lived in a tribe within the fire nation archipelago with her husband and young daughter. It was a small tribe, but held together like a large family. The streets were happy and filled with laughter everyday until a force from the Kaji Shi tribe came to capture it as their own. The tribe's leader didn't wish to go willingly, and many of the tribe's men fought for the tribe but ultimately failed. Lilli's husband was killed in the scrimmage, her daughter was taken from her and never seen again, and to make it worse, Lilli was taken by a couple of attacking men and raped, leaving her to die in the woods. She managed to wander around until she found the Nanmin, and joined them. Tools of Trade: Lilli carries small daggers on her person. The Nanmin is a make-shift tribe made up of people from around the world. Many of them were forced from their original tribes for their own reasons, and as such, they have joined together to make lives for themselves. They travel from location to location, and never remain in the same place for too long (about 2-3 weeks). They have no ultimate location, and simply go in any direction they want and stay where there is food and water. They are currently located along a range of mountains along the Western coast of the Earth Kingdom and are traveling along the mountain range, traveling North. As for her past, it's fairly generic and uneventful. She grew up in her village with her parents, and was an only child. She had an arranged marriage at the traditional age of 16 to one of her most dearest friends from her childhood. She had a daughter when she was eighteen, and named the girl Zaiya. Her life was happy until Kaji Shi forces came and attempted to force them to join their tribe. The men of the Bai Huo fought the Kaji Shi, and Lilli's husband was chosen by the great Agni, and was killed in the midst of battle. Her daughter was taken away with the other children of the tribe, and was sent to be raised into a slave of the Kaji Shi. As if this was not enough, amongst the chaos of battle and terror, Lilli (among some of the other women of the tribe) was taken into the woods by Kaji Shi warriors and brutally raped. Despite praying to Agni the entire time for the experience to end, she was left for dead in the woods alone and wounded. 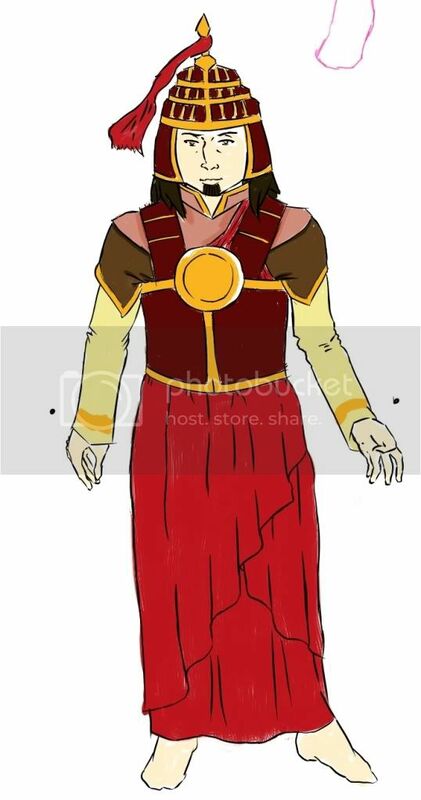 Guided by her instinct and the aid of Agni, she managed to wander through the forest until finding the Nanmin on a small island within the Fire Nation. Outlaw wrote: Alright I finally got it all written up. Very well, OL character has been approved. I liked the idea to use Conzu's tribe to describe yours. Real nice. I'll start right away on the main thread. If you wish, I'll gladly draw your character (as I did to Conzu). Battery wrote: Name: Is known to all as Lilli. Though I know really little about her old tribe... I would gladly like to hear more about it. before I approve this, I need to know more about her old tribe, and more about her recent one (in order to know where they are headed). Also, I wish to know more of her past, before the massacre in her old village. drellert wrote: Though I know really little about her old tribe... I would gladly like to hear more about it. before I approve this, I need to know more about her old tribe, and more about her recent one (in order to know where they are headed). I can do that for you, though do you want it posted here, or PMed? I always did find the story of Esther to be an enjoyable one. yay someone that understood my post! *stupid antisemitic forum system doesn't allow me to post in Hebrew characters >.>* Anyway... mishenichnas Adar marbin b'simcha! When the month of Adar (or Uder in the pronunciation I use) comes: joyfulness reigns! So yes, if you post... I probably won't be able to post anything reasonable tonight or tomorrow.. Although me and Conzu share the same religion origin, I didn't connect from another reason, more secular let's put it in that way. I was busy for the last two days, and now I'm ready to post. well that's okay for me xD I wasn't able to post anyway... could hardly walk. I tried to log in to my lappy, don't ask me how, but I couldn't type in my password. Hey you guys, I thought to do a doodle sketch of your RP characters! That's really good, especially the face that's almost exactly they way I pictured Solus. The only nitpick I have is that his deel ends at his waist instead of at his knees. Outlaw wrote: That's really good, especially the face that's almost exactly they way I pictured Solus. The only nitpick I have is that his deel ends at his waist instead of at his knees. You're right- I thought for some reason it ended at his waist! Prince Kaja doesn't have exactly that kind of armor or weapon, but other than that he looks like the pic I linked to. Question Drellert, what kind of earth is binding Solus? Is it stone or a clay-like substance? Why OL? You're getting any deja-vu's or something? Oh and I added more to my last post. EDIT: darn, I tried to find 'So It Begins but couldn't find it anymore. It probably got lost in the forum-switch. Conzu wrote: Why OL? You're getting any deja-vu's or something? Looking back on it my character from So it begins was really rather bland, I'm not even sure he had a personality. Hehe, to be honest I don't even remember what happened to him after my character did all kind of things to him and in the meantime made the conquered city like a utopia. I only vaguely remember Flam's character escaping with some other characters. Now I have more time to post here! Oh and don't worry OL- I'll fix that bloody sketch. @ drellert, Sorry I haven't posted yet. I've been very busy with the Pesach cleaning lately. And seen how Pesach is starting tonight I also probably won't post for at least another week 'cuz of chol hamoed. Look, I'm sorry i haven't been on line lately (and in lately I mean for the two months). I have been really busy since of... Many, things. Also my computer in the house was used both by me and my housemates (and housemates I mean my brother). I also worked by side on a small project based on the game, to ease on anyone who wishes to join. Yes, because of our lame number of players, I will accept anyone who even joins now. OL- I'm sorry that I havn't fixed your char's sketch... I upgraded to windows 7 and my driver doesn't work on it. When I'll have a newer tablet I'll see to it shortly. I'll shortly check what's new on the RP and also post some things I worked on, for your comfort.